Yes, #TeamRadler! 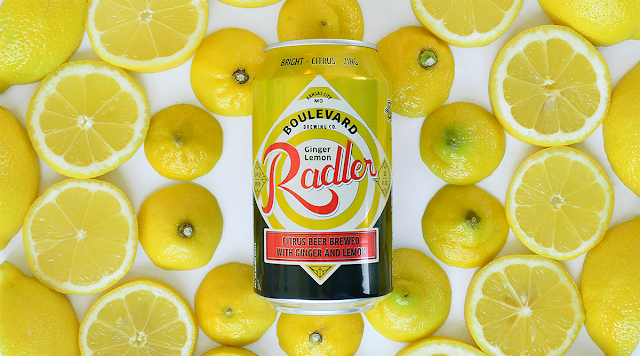 It’s time for the season of Ginger Lemon Radler. Brewed annually since 2014, Ginger Lemon Radler signals a return to longer, warmer days and afternoons and evenings spent outside enjoying beers with friends. Look for Ginger Lemon Radler on draft walls and shelves starting in the Greater Kansas City Area on March 4th! Our take on radler (the German word for cyclist – more on the backstory here) is created using Unfiltered Wheat Beer as the base beer. Following fermentation, the beer is transferred to a blending tank in our fermentation cellar where our brewers add ginger and lemon juice and deaerated, carbonated water (essentially soda water) before prepping the beer for packaging. Since the ginger lemon soda is added post-fermentation, the bright citrusy, spicy flavors remain bold in the finished beer. Pouring a hazy golden color, Ginger Lemon Radler opens with aromas of fresh lemonade and spicy ginger backed by a subtle sweetness from the Unfiltered Wheat base. Unsurprisingly, ginger and lemon dominate the flavor but give way to a bready malt sweetness and a spritzy finish that wavers between ginger, lemon and slight citrus notes from the base beer. Imminently drinkable and refreshing, Ginger Lemon Radler is the ultimate post-activity beer even if you’re doing nothing more strenuous than lifting it to your lips. Ginger Lemon Radler returns, in six-packs of 12oz cans and on draft, starting in the Greater Kansas City Area on March 4th with other regions to follow soon. Areas that typically see Boulevard seasonal beers like Tart Apple Radler and Tequila Barrel Lime Gose should expect to see Ginger Lemon Radler in the coming weeks.